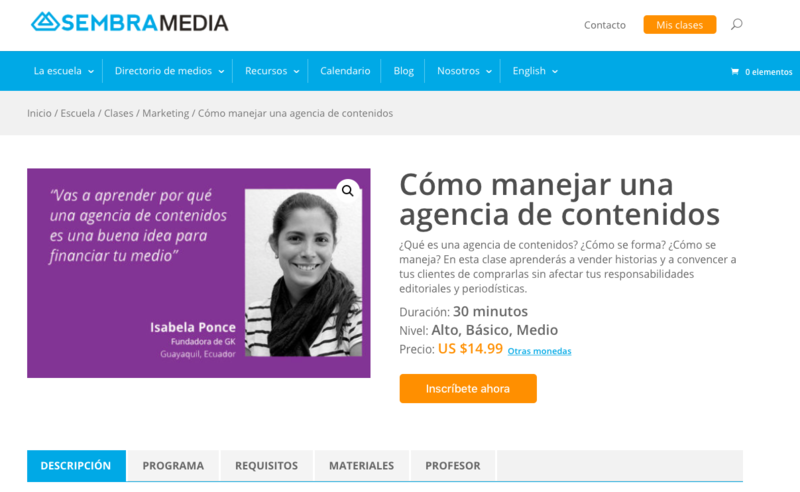 Isabela Ponce's online course website on content marketing is part of what SembraMedia is now offering to help Spanish-speaking journalists gain entrepreneurial skills. This story is also available in Spanish on SembraMedia’s site. I discovered content marketing in 2015. The media outlet I co-founded in 2011 in Ecuador, GK, was going through a crisis: We were having trouble selling advertising because some of our news coverage was controversial, and an initial investment we’d won was almost gone. The question was almost a challenge. After meeting with our future client, we found the answer to our problems: content marketing. At first, we were uncomfortable even saying the words; we were journalists first. But as we started thinking creatively, we realized how we could use our reporting and writing skills to do content marketing. Producing content for clients became the income source that allowed us to continue doing what we love the most: journalism. Then, Janine Warner and Mijal Iastrebner told me about their plans to launch an online school this month as part of their non-profit dedicated to supporting Spanish-language digital media publishers in the U.S., Latin America and Spain. This part of SembraMedia was going to help entrepreneurial journalists build more sustainable businesses. I thought telling the story of our journey, by creating and teaching a content marketing class, would be a great way to contribute and show other journalists how content marketing could help them develop a new revenue source for their media outlets. While I started preparing the class, I realized SembraMedia’s online education concept had a cooperative spirit and gave me the chance to share important skills and insights about entrepreneurial journalism, especially those that no one else has offered in Spanish. I knew one of the most important things I could share in the class was our story. I remembered how much GK’s founder, José María León, and I struggled years ago when we first started searching for new income sources, and how we went from writing four content marketing pieces per month to managing an entire digital content marketing agency with a team that includes a manager, a creative writer, a community manager, an illustrator and a designer. To design my course, my first challenge was to sum up the steps it took to create an agency and transform it into a class. Telling part of the story of how it started was necessary, but I also wanted to include information about the tools we use, how we built the team and how we managed to keep GK on track while working at the agency. Writing the script for the class was not a problem. I’ve always worked as a reporter, writer or editor in print and digital media, so I enjoyed that part of the process. The next part, however, was the real challenge: transforming my scripts into video lessons. I’ve never been a video person. In fact, I think I’m terrible in front of the camera. But to create the class, I got to use my own camera with no one else around. I recorded myself over and over until I felt comfortable with the results. Then, I worked to make it better during the editing process. Finally, I created a list of links and activities students could to do after each video lesson to reinforce the lessons and give them a chance to put theory into practice. These kinds of complementary materials are available in every SembraMedia class, and the practical exercises and resources help students apply what they learn to their own media businesses. Creating courses for SembraMedia’s new online school was an enriching experience because it involved writing, recording, editing and seeking out simple, but extremely useful, tools such as CuePrompter. Ultimately, I realized the process of creating the class was a learning experience itself. Though I don’t think of myself as a great speaker, I really enjoyed sharing what I’d learned in my own business with other journalism entrepreneurs. When I give lectures or workshops, I always start with a premise in my mind: to be as generous as I can be. I do this because I want my students to learn something new and useful. In the end, I was happy with the result because I know how helpful this course would have been for me during my years in journalism school. Other instructors in the school have had similar experiences, including Fabiola Torres, one of the co-founders of Ojo Público, a Peruvian investigative journalism site. Torres is also an International Center for Journalists Fellow and SembraMedia’s ambassador in Peru. Fabiola and I share the experience of journalists throughout Latin America. Our journalism education never covered the business skills we now need to run our own digital media sites. Although I’m enthusiastic about content marketing, I know it won’t work for all of the journalists who create independent media sites, yet with a variety of classes, journalists can find the revenue streams that allow them to practice journalism without compromising their integrity. As the founder of an independent media site myself, I hope others can use my course or others to expand their understanding of entrepreneurial journalism, and that it’s not only about innovating and being creative 24/7 with your editorial projects. It’s about finding new ways of generating revenue so you can continue to publish for years to come. Isabela Ponce Ycaza is the co-founder and editor of GK, a media outlet based in Ecuador that focuses on producing long-form journalism and providing context to complex narratives. The stories on the site include innovative narratives that range from video and podcasts to interactive card stacks and gaming apps. Prior to founding GK, Isabela worked for some of the largest traditional media organizations in Ecuador, including El Comercio, Revista Vistazo and El Telégrafo. She also serves as SembraMedia’s content director and ambassador in Ecuador.